I first visited Wildwater Adventure Park in 1996. I was just a Pa. My two sons were teenagers. I put in my time, paid my dues, and eventually got promoted from a Pa to a Grandpa. That means perfect fun with perfect grandchildren. The perfect place for that is Wildwater Adventure Park. It is a 52 acre park located east of Clovis in full view of the Sierra foothills. We have season passes. Season passes mean that you don’t have to do it all in one day. You can spread the fun around and not wear out your tired old bodies. If you are a youthful, strong, healthy, and adventuresome grandpa like me, you can even partake of the more challenging attractions like the Sidewinder, the Black Hole, or Vertigo. There are even three lakes for fishing. On a recent trip, we saw a man who had attracted no small following of children, including our own grandchildren. He had put a piece of lunch meat on a make shift hook, tied a string to a stick, and were pulling small fish out of the lake with every drop of the baited hook. He didn’t seem to weary of catching and releasing. In the interest of full disclosure, we are neighbors. We can walk to the park. During 4th of July week, we can hear the concerts and see the fireworks from our house. But they are both better “up-close and personal.” There will be more fireworks August 13 and September 3. There will also be Family Fun Nights every Friday through August 12. That means concerts, special foods, and later hours. The rides are open until dusk instead of closing at 7:00 P.M.
You can rent cabanas. I have not done so, but the people I see in them seem cool and content. There are special group areas and deals for groups over 20. Last week, I took a group of over 25 children and enjoyed a catered meal of very good food served by three members of the staff. 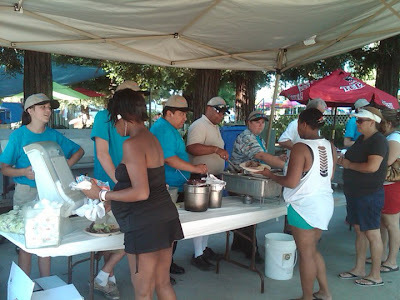 We were there from 11 a.m. to 7 p.m. and there was not a single complaint in the group. Correction: One or two counselors might have alluded to the fact that they were sunburned and tired. My job, poor me, was to sit in the shade, guard the valuables, and read a book. After all, I am an experienced grandpa … and I can play there any time with my season pass. These are just some of the expert witnesses who attest to the reasons why grandparents love Wildwater Adventure Park. If it is fun, awesome, and cool … and if we take our grandchildren there, then we are fun, awesome, and cool too. It is a win win situation. Our representative, Joan McPherson, pointed out to us that the park had been voted “Central California’s BEST Water Park!” The park boasts of over a quarter million plus visitors each year. 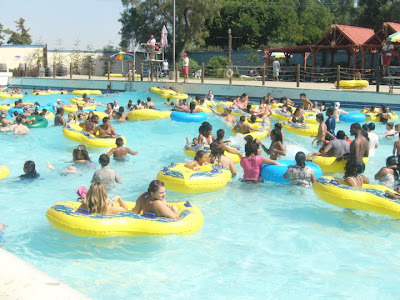 Wildwater Adventure Park started in 1974 as Serena Vista Lakes and then changed its name in 1977 to Clovis Lakes. It came into its present name, with expansion, in 1980. In all, there are 20 attractions and 38 rides. I must admit, however, that the park is a lot more enjoyable since I lost 160 pounds. There is some walking involved. With that sort of variety, it removes a great deal of the thinking necessary to be a fun grandpa. It is like you can take the summer off from staying two steps ahead of your grandchildren. Perhaps that is the only downside. I do like to practice thinking for as long as I can! But I suppose I can find something to think about … if I give it some thought. Bring your sun block. Bring snacks if you like. Leave all your glass containers at home with any sour disposition you might be inclined to nurture, grab your grandchildren, get in the car, and drive out to my neighborhood. There is an adventure waiting for you. For more information on Wildwater, visit their website.